Can Purchase Tickets at the Door or at THEIWL.COM! Will also be broadcast on Roku for all of our IWL “Plus” members! The Sircus is back in town! 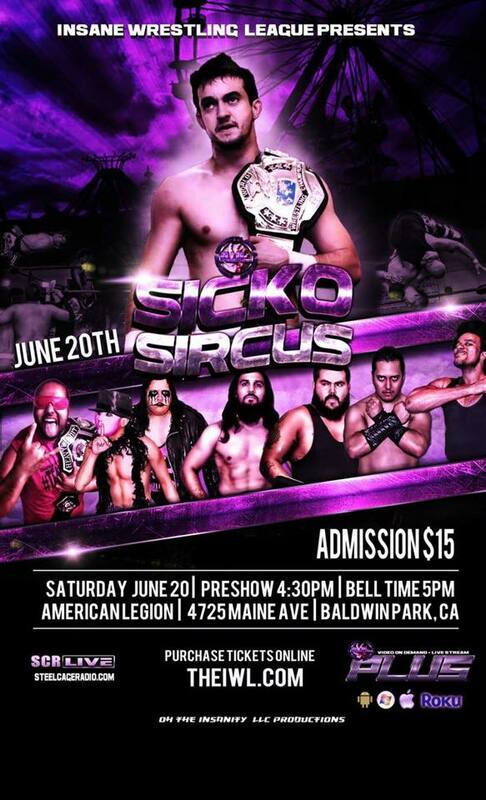 One of IWL’s most beloved events is returning this June at the American Legion Hall of Baldwin Park! The 20 Man “Rumble Style” Battle Royale is back where the winner receives a title shot for the IWL Championship! This will be the 5th Sicko Sircus ever. Previous winners include “Cast Iron” Cothern, “Arc Angel” KC Jones, Johnny Saovi, and Chris Kadillak. Only one of these men went on to become IWL Champion, and that was 2011’s winner Johnny Saovi. However, he did have to go through some trials and tribulations just to receive that shot. Yes, there has always been somewhat of a curse when it comes to the Sicko Sircus winners. Will the curse be broken this year? Who will win and get that shot against the IWL Champion?